Bestselling author Brandon Sanderson is back with his 336-page “novella.” In between lengthy, epic fantasy projects, Sanderson likes to have fun with some short pieces. The Alloy of Law is an example of one of those once he was done with The Way of Kings and Towers of Midnight before he started working on the final Wheel of Time book, A Memory of Light. In the acknowledgements he talks about the potential to write two more trilogies set within this world, each trilogy set further in the future from the original Mistborn trilogy. The Alloy of Law is a shorter work set in the time of this proposed second trilogy. Three hundred years have passed and the planet of Scandrial is now turning into a modern place with railroads and electric lighting in the homes of the wealthy. Waxillium Ladrian is called back to his old city of Elendel to take the mantle left by the death of his uncle, living the city life and looking for a potential wife. As he tries to turn away from his rebel, gun-toting days, a series of strange train cargo thefts and kidnappings pulls him back into action. Wax will need Allomantic powers, with his ability to Push on metals; he’s also a Twinborn, with the Feruchemical ability to make himself lighter or heavier at will. While Sanderson perhaps should’ve gone with a shorter name for his main character, or stuck with Wax as the official nickname – seeing twenty Waxilliums on the page gets a little annoying – he does what he did best with the Mistborn books, using his magic system skillfully and telling a great adventure story. Alloy of Law is definitely set in the time of a steampunk type world that fans will immediately latch on to. Originally written on December 1, 2011 ©Alex C. Telander. To purchase a copy of The Alloy of Law from Amazon, and help support BookBanter, click HERE. The sub genre of “steam punk” is growing in popularity, giving zombies and vampires, and the concept of the end of the world a run for their money. With a very favorable quote from Cherie Priest, author of the great bestselling steam punk novel “Boneshaker,” on the front cover; “Mechanique: A Tale of the Circus Tresaulti” from debut author Genevieve Valentine is a great starting point for anyone looking to get into this genre of zeppelins, steam, and cool outfits featuring oversized goggles; and an automatic must read for any fan of the genre. The Circus Tresaulti is unique; think Cirque du Soleil on acid but with people of a mechanical nature; it is the show to end all shows. These mechanical men and women – who have suffered accidents and falls throughout their careers and had their human body parts replaced with strong, metal ones – spin, flip, balance and seem to defy gravity on their trapezes, as they fly through the air like human birds. But these mechanical performers are still people, with complex lives and varied histories – some filled with happiness and joy, other dark and filled with pain; this is their story. “Mechanique” is a special story, told with and short and precise writing style that hooks you right in, along with short chapters that allow you to learn a lot about this war-torn world and its varied people fast. Illustrations from Kiri Moth help to bring described images and scenes to life. Genevieve Valentine takes the reader on a journey they won’t soon forget. Originally written on May 21, 2011 ©Alex C. Telander. Lyra Belacqua is a young girl who spends her days roaming the many hallways and rooms of Jordan College, Oxford, where she makes friends with everyone regardless of class or status. She’s just looking to have a good time and loves taking risks, whether it be climbing the roof of the college, or chasing and attacking the gyptians who show up every once in a while on the river. This is a different world to ours, where everyday electricity doesn’t exist. This is a world of zeppelins, steam and air powered machinery, gyroscopes and wheels and cogs, essentially a steampunk world. Also in this world every person has what is known as a dæmon, essentially the embodiment of a person’s soul in the form of an animal. When young, children’s dæmons can change form, but when they reach puberty the dæmon settles on a single form for the rest of their lives, giving one an insight into the person’s nature. But Lyra’s world changes when first she saves her grandfather, Lord Asriel, from being poisoned, and then learns of his work in the distant icy north where work is being done with something called Dust, the northern lights, and something about another world in the sky. Lyra then meets Mrs. Coulter, who she immediately takes a liking to for she is so strong and impressive and knowledgeable, that is until Lyra discovers that she is the one who has been kidnapping children and taking them to the north for experimentation. Managing to escape, Lyra joins with the gyptians who head north to find out what is going on with all this business about kidnapped children and Dust. The rumors are terrible. It is said that experiments are being done separating children from their dæmons which, considering it is taboo for a person to even touch another’s dæmon, does not bode well for Lyra and the gyptians. 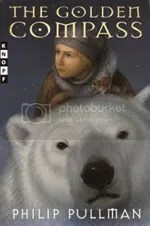 It is in the north that Lyra finally discovers everything that is going and more importantly, why it is happening, as well as a giant armored warrior polar bear, Iorek Byrnison, known as panserbjørne; and a Texan balloon-fighting man called Lee Scoresby. His Dark Materials, in my opinion, is even better than the Harry Potter series for the subject matter is far more complex with truths that relate to every reader. And with a move adaptation of The Golden Compass set for release on December 7th, now is the perfect time to read this magical series for the first time, or simply to reread it again. Originally written on September 13th 2007 ©Alex C. Telander. In an alternate America of the 1880s, Leviticus Blue invents a mining machine that is supposed to revolutionize the growing town of Seattle. Instead he loses control of the Bone-shaking Drill Engine, which breaks loose and tears through the underground of the town, causing buildings and roads to collapse within the tunnels made by the machine. Then a mysterious blight gas is released that somehow turns anyone who breathes enough of it into the living dead. Sixteen years pass and the city is walled off, turning it into a zombie graveyard. There are those who live on the inside of the wall, eking out a survival, always terrified they will breathe the gas and be turned. Then there are those who live on the outside of the wall, having abandoned their city, living in poverty, trying their best to get by. Finally there are the zeppelins and airships that ferry, transport, and smuggle items into and out of Seattle. Briar Wilkes, husband to the late Leviticus Blue, is doing her best to get by, while supporting a growing teenage boy. Only Ezekiel wants to find out more about his dad, wondering if he might still be alive, and whether he was truly to blame for the tragedy that befell Seattle. Ezekiel sneaks past the wall through a sewer pipe and travels into the doomed town. Briar soon discovers that her greatest fear has come true, and she must go in after him. She will make friends on the inside, but also enemies, while fighting to find out if her son is still alive, as well as making sure she doesn’t get turned by the blight gas. Cherie Priest has created a wonderfully original story in what she says is a response to the Steampunk look of hat and goggles. The result is a fun, action-packed book that explores the relationship of a mother and son with an unusual past, along with designed yellowed pages and brown print that gives Boneshaker a whole unique look. Originally written on January 24th, 2010 ©Alex C. Telander. 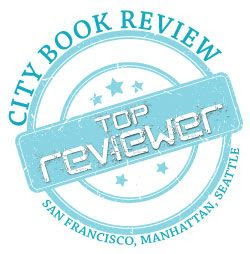 For an interview with Cherie Priest check out BookBanter Episode 25. Stephen Hunt’s debut novel, The Court of the Air, is a fun romp through the steampunk world as he successfully combines a Victorian, Dickensian feel with interesting machinery and a strange and unusual world. It is the story of two orphans – you can’t get more Dickensian than that! – who are on the run from various deadly and clandestine groups. There is Molly, who is being chased by assassins of a mysterious group; she fortunately finds some friends along the way and is able to go underground, into the sewers and caverns below, discovering another world. Then there is Oliver, who has been framed for his uncle’s death, and must flee for his life. He takes to the air, escaping the fey-hunting Special Guard, in a great air ship. They both draw the attention of the Court of the Air, an unknown and secret organization that spells dread for all. While this first book in the series is somewhat overloaded with gimmicks and gadgets and characters and things going on that can often lose the reader who must stay focused to follow the story, Hunt has nevertheless created a unique and entertaining steampunk story that continues in The Kingdom Beyond the Waves. Originally written on December 21st, 2009 ©Alex C. Telander. 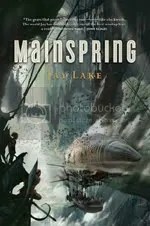 Mainspring is your classic steampunk novel: the world is run by machinery. The Mainspring is at the center of the world, constantly turning and working, making every other cog, wheel and spring turn and work. The world is split between the two hemispheres by a giant metal wall that reaches into space. The planet turns, and runs on an orbiting track around the sun and at midnight the wall connects with this track for one moment, obliterating everything on top of the Wall and starting anew. All this was created and set in motion by God: the Mainspring is the heart of the world and is also the heart of God. In this world, the War for Independence never happened, and at the turn of the twentieth century, Britain still controls the colonies. Hethor Jacques is a sixteen year old boy and a clockmaker’s apprentice. He is visited by the Archangel Gabriel and told that the Mainspring is not running well and requires the Key Perilous to set it in correct motion again. This is necessary once over many generations and the time has come again and it is up to Hethor to perform this task. With lots of problems and obstructions along the way, Hethor makes his treacherous journey to Boston where he is press ganged into the British navy on Her Majesty’s Ship of the Air Bassett: an ordinary ship that is attached to a great air balloon sending it high into the sky. Commissioned to aid Her Majesty’s ships at the Wall, the Bassett travels over the Atlantic to the great iron curtain where they come face to face with horrors and monsters never imagined. The Wall is a place of legend and story, of fabled cities filled with jewels and ghosts. With this severe downward turn to the novel, Mainspring was hard to finish. The failing of the book was in going from a complex and fantastic world of air ships and machinery and exotic places to a religious dogma coupled with a fascination for an ape-like race. Nevertheless, Mainspring possesses many facets of the steampunk novel making it a classic in some ways, along with amazing cover artwork of the Bassett at the Wall. Originally written on August 15th 2007 ©Alex C. Telander.